At Bell Helicopter’s Fort Worth facility, Tim Otteson, a Bell demo pilot, walked me through the features of the Bell 407GXi and the G1000H NXi. The Garmin upgrade, along with a Rolls-Royce 250-C47E/4 Fadec turboshaft engine, sets the 407GXi apart from the previous 407GXP. 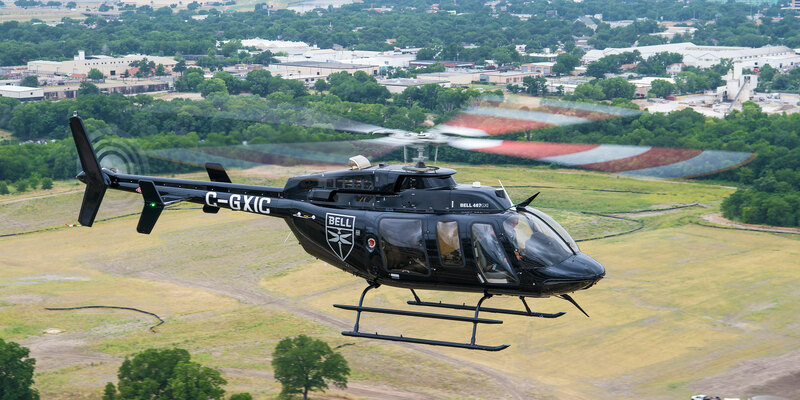 The Bell 407GXi was certified by Transport Canada at the beginning of 2018 and is considered to be a light-single helicopter. At gross weight, the 407GXi can reach a maximum cruise speed of 133 knots and has a cargo hook capacity of 3,100 pounds. This helicopter is equipped for ADS-B Out as well as ADS-B In ahead of the 2020 FAA ADS-B Out mandate deadline. A Garmin GTX 335R ES transponder is standard and provides the ADS-B Out capability. The optional Garmin GTX 345R ES, installed on this helicopter, is available for ADS-B Out and In. The Bell 407GXi has been designed to support corporate, aero-medical, energy, and parapublic operations. The corporate configuration has a cabin volume of 85 cu ft and accommodates up to five passengers. The 407GXi’s ability to operate in extreme environments, ease of patient loading and unloading, and added safety features support the helicopter’s role in aero-medical operations. The helicopter’s 862-shp Fadec-equipped engine and all-composite four-blade rotor system provide performance, speed, and a comfortable ride. The main components of the integrated avionics systems include two 10.4-inch GDU 1050H high-definition displays and two GIA 64H integrated avionics units. The system additionally features a GEA 71HB engine and airframe unit, a GSU 75 air data and attitude heading reference system and GMU 44 magnetometer, a GMA 350Hc audio system, and a GTX 345R ES mode-S transponder. The standard configuration of the Bell 407GXi’s flight deck includes synthetic vision and initial installation of the HTAWS and navigation database. New features of the NXi include ADS-B enabled TargetTrend and TerminalTraffic, wireless cockpit connectivity, HSI mapping on the primary flight display, and other capabilities. Two card slots are available for data exchange tasks such as flight planning, database uploading, or flight data downloads. The optional Flight Stream 510 wireless gateway, which comes in the form of an MMC card and installs in one of the slots, had not yet been added to the GXi that I would be flying that day. Flight Stream 510 allows the NXi system to stream real-time information between avionics and compatible mobile devices running ForeFlight or Garmin Pilot. This can include two-way flight plan transfer, traffic sharing, weather, GPS, and back-up attitude information. The option also enables Garmin's Database Concierge to wirelessly transfer aviation databases from the Garmin Pilot app to the G1000H NXi system, which is a much simpler way of updating information such as Jeppesen NavData or Garmin's nav, obstacle, and terrain databases and SafeTaxi, FliteCharts, and Basemap information, and the AOPA Airport Directory. Pilots can prepare a flight plan on Garmin Pilot on an iPad or Android device or ForeFlight (iOS only) and then wirelessly load the plan into the aircraft’s avionics. The pilot can also check for any database updates and then download the updates to the mobile device. Preflight time can be reduced as the Database Concierge can upload the database updates and sync transfers directly with all of the installed displays. Garmin’s TerminalTraffic display has been designed to keep “nuisance” alerts to a minimum, and this was a noticeable advantage during the flight. The system is designed to minimize and abbreviate alerts about nearby fixed-wing aircraft when the helicopter is hovering or performing maneuvers. Below 40 knots and 400 feet agl, the alert is coupled with an aural “traffic” message. Otteson demonstrated and then turned over the controls so I could perform various maneuvers in the 407GXi. The helicopter handles smoothly and precisely and is enjoyable to fly; the engine provides plenty of useful power and the avionics features increased my situational awareness and decreased my workload. As the flight went on, I felt increasingly more comfortable with my visual scan, and it’s clear to me that pilots who fly with the G1000H will easily be able to transition to the G1000H NXi. The 407GXi is an incredibly fun machine to fly and it quickly became obvious to me why the 407 platforms have maintained a popular following. The upgraded engine coupled with the new avionics system demonstrated their immense value throughout our flight and the enhancement they would provide to multi-mission profiles. I stepped out of the helicopter and left with a new understanding of and appreciation for both the new Bell helicopter and its Garmin avionics.